Is clutter piling up in the closets and cabinets of your Springs Apartments home? A yard sale is the classic solution to thinning out your possessions while putting a few bucks in your pocket. No yard, you say? No problem! 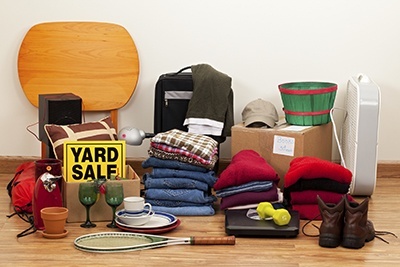 Check out this list of suggestions for creative yard sale options. Talk to one of your house-dwelling friends about using her yard. You can offer to include any items she may have as a "rental fee," or she might decide to join you in a tandem yard sale. More and more people are recycling and repurposing as part of a green lifestyle. Take your items to a resale or consignment shop where they will handle the business end for you. Consignment shops pay upon sale, but other shops may give you cash on the spot. If you have a lot of items to sell, consider renting space at a flea market or swap meet. Fees can be as low as $5 per day, so shop around for the best rate. Be sure to check with the owner regarding any license requirements. You may end up having so much fun that you get hooked! Churches and community organizations such as Kiwanis and Rotary Club frequently sponsor yard sales. The events are held to benefit the organization and other charities, so they may charge a fee for participation or simply take items for donation. Virtual storefronts on sites like Craigslist, eBay and Amazon reach a greater number of potential buyers than you could draw with an actual yard sale. Don't overlook your social media accounts, too. Post pictures of your items on Facebook, Twitter and other sites. You never know when it will be just the thing that a friend of a friend is looking for. Occasionally Springs hosts community-wide yard sales, too, so check with the office to find out if there is anything coming up. Some people end up with a fairly lucrative sideline business reselling items. Are you one of those individuals? If so, share your favorite tip with us in the comments!